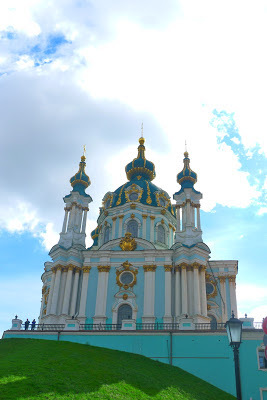 Initially Kiev was only on the list of cities we were visiting because it was a way to take the trip across Europe to London bypassing Belarus where a visa (even for a straight through transit) costs £100. While doing research and planning for our trip I noted down a post on Travel belles with a recommended tour for the city. After reading this I was more enthusiastic about our visit. Our first day didn't pan out too well, after our train arrived very early in the morning I followed the hostel directions, which were at first very good. Until we couldn't find the correct road to turn down, and then walked past the hostel entrance at least 3 times ('You'll see our sign' - no we won't because it's incredibly small!) The rest of our first day had terrible weather so this gave us time to relax and catch up on reading, sleeping and blogging. Day two was a lot more productive. We followed the travel belles advice, but in reverse as we were staying on Andrew's Decent. In Kiev we saw so many weddings! Every place we visited (even the War Memorial) had bridal parties taking photos. At one place there were four weddings all next to each other! We could have seen this as a sign, but then we're both single so no wedding bells for us in the near future! During the Travel Belles tour we made a stop, as suggested, at the Pinchuk Art Gallery (we also had some lunch here which was delicious!) The main exhibitor when we visited was Anish Kapoor. I have since discovered he is the artist/architect behind the big Bean in Chicago and the ugly construction outside the Olympic Stadium in Stratford. 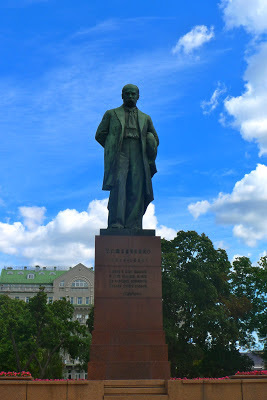 His show in Kiev was weird. The piece that most affected me was called 'Shooting into a Corner' and was a whole room, filled mostly with a huge cannon that has shot out vibrant red thick paint (which looks like blood) The image here doesn't show exactly what we saw as we were in a small room with a low ceiling so the paint was closer and more splattered. 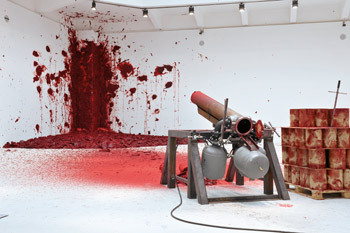 Most of Anish Kapoor's pieces were a little too wacky for me. But further into the gallery were other displays from various artists. Our very own Damien Hirst made an appearance and his was quite thought provoking. A balloon floating over a fan above sharp knives 'A History of Pain'. 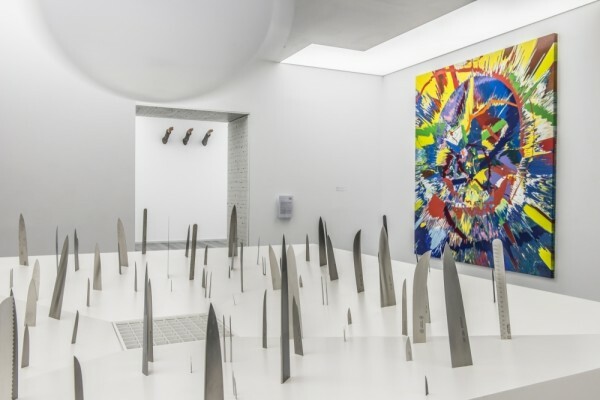 The last sculpture I can remember (As I write this three months after visiting) were (bordering on pornographic) sculptures from Japanese Artist; Takashi Murakami (Image Below). Overall Pinchuk was a worthwhile visit. It was free and whether you enjoy the art on display or not, it certainly makes you think and leave a lasting impression. 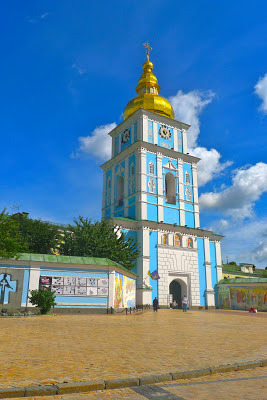 Kiev city was a great place to walk around, easily accessible on foot (although there are a few hills and lots of steps). Andrew's Decent and the surrounding streets have some great stalls, I bought some of my favourite souvenirs from Kiev (a photo of St Andrew's Church from an elderly man standing away from the rest of the stalls and wearing milk bottle glasses and an etching of Lenin in London). The hostel -Dream House Hostel and Bar- was great; perfectly set up for backpackers - just look out for a small sign on A4 paper. 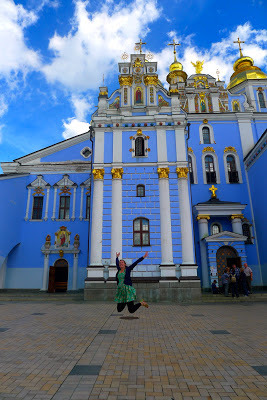 It was not somewhere I was desperate to visit, but it is now on my list of cities (and countries) to re-visit! This was only the second couple we saw at our first destination of the day; Andrew's Decent. St Michael's Cathedral. You can buy Cherry Honey Mead outside, but I wouldn't recommend it! 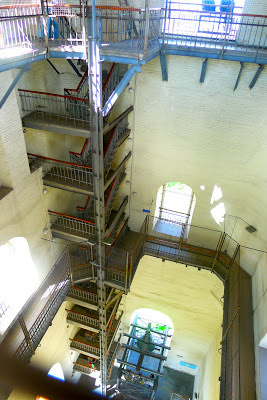 Hundreds of steps to the top of St Sophia's Bell Tower.